Business owners prefer Portland General Electric: the local power company ranked highest in the West among large utilities in the 19th annual study released by JD Power and Associates. Released in December, the JD Power 2017 Electric Utility Business Customer Satisfaction Study included a survey of business customers across six categories: customer service, billing and payment, power quality and reliability, communications, price and corporate citizenship. 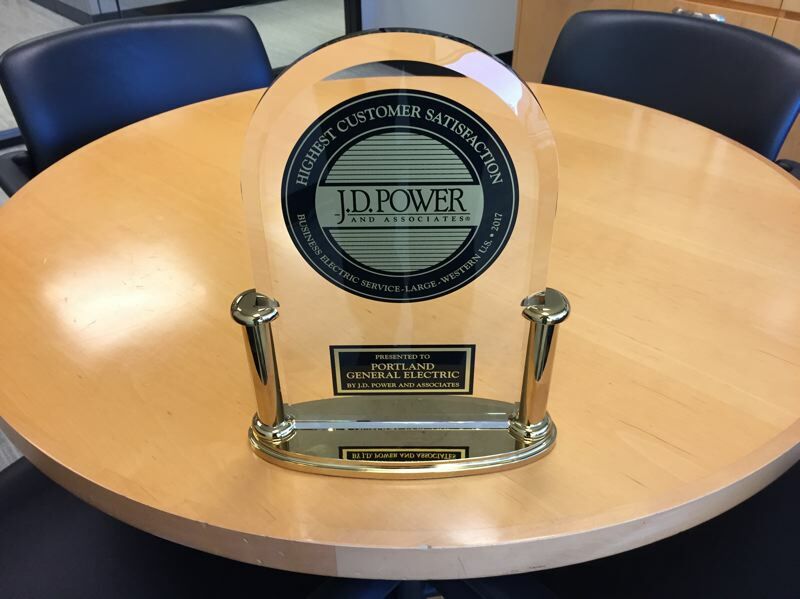 JD Power is a marketing, consumer intelligence, and data and analytics company that helps its clients measure, understand and improve the key performance metrics that drive growth and profitability. Across all six factors, PGE consistently scored in the top 10 percent. Portland-based PGE is a fully-integrated energy company servicing 873,000 customers across 51 cities. For 125 years, PGE has been delivering energy to Oregonians and now employs 2,700 statewide. "We know how important it is to provide excellent customer service and be our customers' most-trusted energy partner," said Bill Nicholson, senior vice president of Customer service, transmission & distribution at PGE. "We also appreciate the high marks on power quality and reliability — they're a key to our customers' success and important for our state's economic development." PGE scored 804 out of 1,000 on the customer satisfaction index ranking, above SRP at 798, APS at 765, Xcel Energy at 762, Southern California Edison at 759, West Large Average at 759, Rocky Mountain Power at 757, L.A. Dept. of Water & Power at 756, Puget Sound Energy at 755, Pacific Gas and Electric at 753, Pacific Power at 753, San Diego Gas & Electric at 748 and NV Energy at 747. The rankings are based on numerical scores. The JD Power 2017 Electric Utility Business Customer Satisfaction Study, now in its 19th year, measures satisfaction among business customers of 87 targeted U.S. electric utilities. Altogether, these utilities provide electricity to more than 12 million business customers. The study is based on responses from more 19,000 online interviews with business customers who spend at least $200 a month on electricity, and satisfaction is calculated on a 1,000-point scale. Established in 1968, JD Power is headquartered in Costa Mesa, California, and has offices in North/South America, Asia Pacific, and Europe.